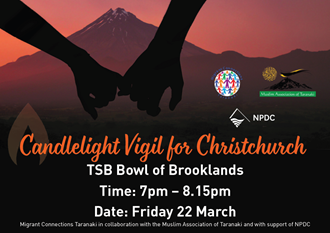 You are invited to come together this Friday (22 March 2019) at 7 pm with Migrant Connections Taranaki, the Muslim Association of Taranaki and NPDC to honour the Muslim community and people of Christchurch at a Candlelight Vigil held at the TSB Bowl of Brooklands. This event will bring us together to show Taranaki’s support to Christchurch and that we stand with them and share their grief. Let us show that the people of Taranaki will not stand for any acts of violence and terrorism in our country. More details on what will take place during the event will be shared soon. You can find more about this event on Facebook.